ATLANTA, GA, September 02, 2017 /24-7PressRelease/ — Chemtronics, a leader in high precision cleaners for the electronics and telecom industries, is offering a free guide to repairing flood damaged electronics and telecom equipment. When used with the included procedures, Chemtronics products are an efficient and effective tool for the recovery and restoration of electronic and telecommunications equipment. 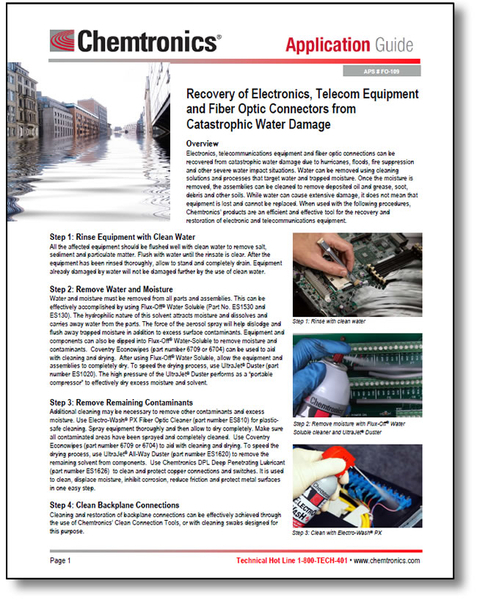 The Chemtronics application guide “Recovery of Electronic, Electrical and Telecom Equipment from Catastrophic Water Damage” provides step-by-step instructions how to clean water damaged electronics, electric and fiber optic equipment. Download this free guide by clicking here.